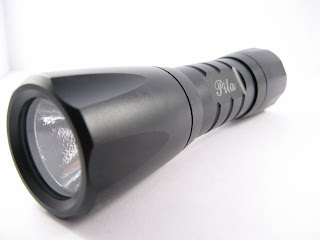 The GL2 Cree is a two cell flashlight from Pila featuring a Cree LED. The light is activated by a tactical tailcap switch with momentary activation. The construction of the switch makes accidental activation or deactivation of the light difficult and has a very good tactile response. Pila also selss LED tailcap switches with 5mm Leds in different colors for a lower level of ilumination and longer runtime. The light can use either two primary C123 lithium cells or rechargeable Pila 600P or 18650 batteries. With primary cells runtime is about 1 hour and a half at 130 lumen, with the 18650 runtime goes to 5 hours but the brightness is about 90 lumen. As other Cree LED lights the GL2 is extremely bright with a beam that combines a very strong hotspot with plenty of sidespill making the beam a very good combination of flood and throw. It can reach distant objects and can also illuminate a whole room without a problem. Between the LED and the reflector there is a small space where a hobbyst can install a tritium tube if he wants. The construction of the GL2 is its strongest point, the body in Ha-III aluminium is really solid, even looks stronger than Surefire's bodies and the o-rings make the light water resistant. The GL2 will resist drops, hits, scratches and very rough conditions making it a great light for canyoneering, caving, hiking, camping and other outdoor activities. It is, maybe, a little big for EDC carry but if you are going to be in the wilderness this is a great all around flashlight that you can use without any special care. You can read more and order for $70 from JSBurlysflashlights.